Running on "E". Emotion. It's something that I have done with running from the first time I laced up as an 11 year old amidst the dissolution of my parents marriage. I needed running then to take the jumbled emotions and give them a place to spill out to make sense of my world. Some of my most memorable runs have been one that have been fueled by emotion even before I have hit the road. They have not been the ones where I have hit a mileage or time mark and fallen into that "runners high" that carry you through the run. Rather, I have been "high", fueled by emotion before the start of the run in hopes to let it all spill out. I have laughed, cried, and tried to make sense of it all when my emotions have poured onto the road. During those runs, I have run as fast or slow and as long and short as I have needed to to wring out those emotions. I finish those runs completely spent emotionally. It's a different kind of hurt. So what does that have to do me with me now? Surely I would have grown out of that stage? Isn't there an old saying out there that you get wiser through the years? In some respects, yes, I have gotten wiser. My reactions to things are not as knee jerky as in the past, but from time to time I have returned to the road for a run where the cup needs to runneth over. And runneth over my cup did last week after a particularly rough patch at work. Yes, it was my choice to let it get to me like that, but when I got home I needed to let my legs feel the road and emotions needed to spill. Interestingly, I had a dialogue with myself when I had looked at the "training plan" and saw that it was an "easy" run. That was not what my body needed. So I compromised. I mixed it up where I ran slow to warm up and then hit it hard. Running at a speed for me right now is near my puke threshold, but nowhere near as fast as I have run in the past. But it felt good. The emotions, thoughts, fell out and I felt spent at the end. I felt renewed. What did not renew, were my legs from that effort and the next morning, I stupidly did a hill session on the treadmill leaving my calf and heel screaming at me. Several days of easy running, massage, stretching and a battle with some cold/virus have given me time to think. It was the first of many collisions that I believe running on E and the "training plan" will have on this new journey as I have made this choice to follow a plan to see how far and fast I can run. A plan is just that a plan, and although I want success during and at the end of the plan, the long view is one I must take into account. From where and when I started there may be not enough of a buildup to get my body in the shape needed to run a BQ in the spring. However, I also am cognizant of the fact that I sometimes must also run on "E". Its who I am. During the cold and dark season of winter, there are times when I actually listen to that little voice in my head and stay inside to do a workout. Rather than stupidly slog it out in unsafe conditions I can turn to the treadmill or bike trainer to get my fix in. While running outside, I might lose myself in some podcasts, inside, I need something more to occupy my time. Recently, I ran across this little gem. 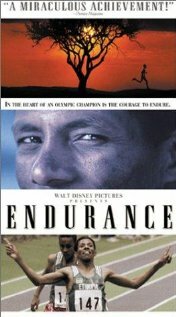 Endurance (1999) is based on arguably one of the greatest distance runner of all time Haile Gebrselassie as it loosely follows his life from that of a young boy who ran because there were no other means of transportation to the 1996 Olympic Games where he wins the 10,000 meters. If you are looking for training tips, there are none unless you gleam from the movie that he has been running since he has a boy. What you will get is motivation from a man who despite naysayers and odds, continued to believe in himself and never gave up. That in of itself is enough to help turn the cranks or drive the belt of the treadmill in the winter. 2010 was a strange and winding road in my relationship with running. From the cheers of the crowd on Bolyston street at the Boston Marathon to a wooden mile post at the Burning River 100 where I dropped out, running taught me some important life lessons as I move forward. 1. You have to be fully committed to your goal. Whatever the goal, you have to have the willingness to see it through or you will fail. It doesn't matter if you have previously met the goal before and are trying to better it,because that doesn't lessen your chances of not failing if you try again. Neither does just saying that you are going to do something make it that you will. You must commit to the training or the process both physically and mentally. Sometimes it will be the mental challenge that will determine the rate of your success. I firmly believe that your ability to finish is determined long before race day. You can't be at the starting line and hope to find "it" that day. "It" was found long ago out on the training runs. Race day is really a celebration of that training. It is icing on the cake. 2. Running with old people is cool. Getting a chance to run with my dad again were some of my favorite runs this year. To watch him restart his running career again and get the chance to run a couple of races again proved to me that it doesn't matter your age, size, or shape that running can rejuvenate you. It can make you feel like a kid again. It can bring back together a father and son whose roads had taken them down different roads. My relationship being with running being what it has been over the years has sometimes lent itself to just being one of obligation. There wasn't any real goal or destination in mind just daily forward motion. For me, that is really ok. I need running as much as I need my daily cup of java. Its not an option, it is a necessity. Sometimes, the simple act of moving forward will lead me down the path back to desire, back to fire, and focusing on a goal. I wouldn't call the time I spent during the latter part of this year a funk at all, because I never saw it as that. I knew I didn't have a goal to focus on and knew that if i just kept running, that I would find it. Find it, I have and like Nas said in his song " I know I can."